Sheila J. Petre is one of my favorite Anabaptist writers. She has a delightful way with words, she’s human and fallible, and she’s shockingly funny. Sheila lives in Pennsylvania with her husband Michael and their seven children ages ten and under. In addition to nurturing these favorite people, she gardens, writes, laughs, hosts foreign exchange students, and preserves her household’s food and sanity, though not in the same jars. Today I’m sharing an interview for which I interviewed her for. (Help, Sheila? I need your way with words over here.) Some of you already know her writing; it has appeared in several magazine publications. 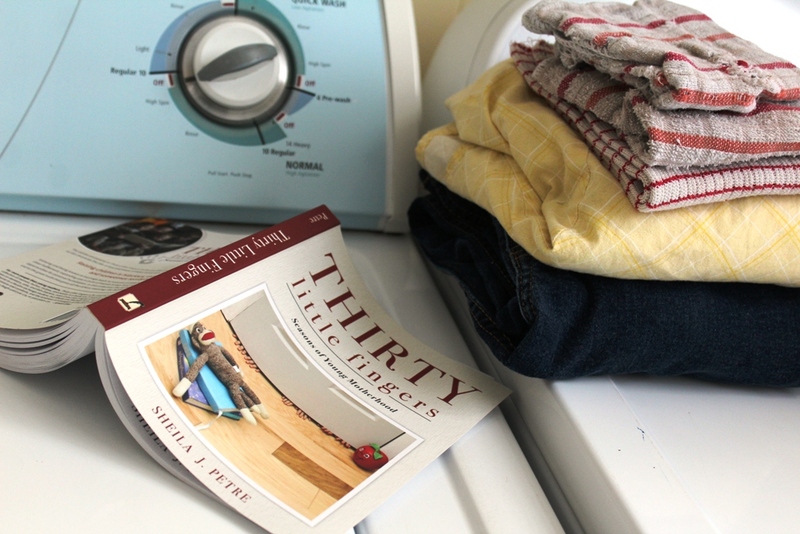 Sheila recently released a brand-new book called Thirty Little Fingers: Seasons of Young Motherhood, and that’s what I want to talk to you about. Tomorrow she and I will be offering you a chance to win (ahem: earn) a copy of this delightful read. But for today, I’d like to let you behind the scenes into our interview, and some little-known facts about an author-friend I’ve come to love very much. So here we go. 1. What does the J stand for in your name, Sheila? I was born in May, but named after my mom, Laura June, who was born in June. Since we named our second daughter Laurel June, she will now have to say her middle name is June because her moms’ middle name is June because her mom’s middle name is June because she was born in June. Thus we complicate things for our children. Because it’s something I can make a success of. I’m horribly competitive, and don’t like doing things that I can’t succeed at. I rather flop at sewing, so I stopped doing it. Alternate answer: I am almost obsessed with giving. Writing is one of my most natural ways to give. I see it not as a spiritual gift (which I must exercise or fall out of the will of God, as some would believe), but as an expression of a spiritual gift, which is in this case, giving. Any time of the day, and as often as I can. Once, at Michael’s recommendation, I tried to wake early to write. Some weeks later, he agreed with me that this was not working: He doesn’t like grouchy women. It’s the question people ask more than any other, how I find time to write. Slowly over the years, I have begun to acknowledge the grace of God more publicly, more freely. He manifests it to me in various ways: Michael’s encouragement of my writing; my particular church setting; my maid; my children’s general health and well-being. 3. Have you published other books? I wrote Transplanted in 2011 at the request of Delmer Martin, a widowed friend; it’s his first wife’s life story. From Joy…to Joy, published in 2012, is a small compilation of poetry detailing the journey through grief. Vignettes is a directory of 200+ Anabaptist women writers, now in its second edition. Thirty Little Fingers is the first that is exclusively mine. 4. What is your favorite response to your books? My favorite response to Thirty Little Fingers so far was from my cousin Anthony, who edited it for me. I heard through the grapevine that Anthony’s wife was glad he read the book because now he is finally convinced that she is normal. 5. What corners do you cut to eliminate the things that just don’t matter, and focus on the things that do? I wear disposable diapers on my babies. I quit having the cloth diaper discussion some years ago, so I’ve eliminated the energy that goes into having that discussion, too. My mother-in-law, who loves to sew, does a lot of my sewing. We as a church don’t have a lot of mid-weekly functions, and I don’t have nearly as much company as I wish I did. I don’t have girl-parties. It matters less and less to me what people think about what kind of a housekeeper I am. (Translation: My house is often a mess.) I grew up the next-oldest of eleven, and in recent years, I have been increasingly grateful for the ways my childhood taught me efficiency in running a household with many members. 6. Tell me a little about your kiddos? They are average in all but height, intellect and physical appearance, wherein they are a little above average. There is a small cache of job-treasure-hunt papers in my kitchen, in Rachael’s handwriting, which say things like “I’m hiding on the table. Please get these dishes off of me quick! Fast! HURRY!” And “You need clothes tomorrow. Get them.” And “The calendar needs changed. Please change it. It isn’t October anymore but November!” Laurel has been cackling over Laurel stories out of the book for the last week, particularly those wherein she trumped a preschool Rachael. Joshua still has one of the most beautiful smiles you will ever be bowled over by. Older women regularly want to kidnap Isaiah; they don’t know what a homebody he is, pure introvert. Allegra is four, one of my favorite ages, and would subsist on junk food if we let her. (Sometimes we let her.) Benjamin is my most good-natured and I am happy to tell you he can go potty in the potty chair now. Stephen, ah, I love all my babies more, younger, something Michael claims I’ve said with all six of my last ones. He can’t be right; I wouldn’t have said it with Rachael, since I had no others to compare with her. Have you ever met a woman who would change only one thing about herself if she could? Physically, I would have slenderer ankles. Spiritually, I would always be sure I have the Holy Spirit within me. Personality-wise, I would be less competitive, and I wouldn’t be so selfish in conversation. Circumstantially, I wish I lived closer to my mom. …And what do you like most about being you? Physically, I like my face most, because it is such a plain face, not homely and not gorgeous, which has spared me hours of trauma associated with either extreme. Circumstantially, I like most that, whew, what don’t I like most? I like my family, house, church, maid, midwife, friends. 8. What do you like most and least about being a writer? I like most that it brings me into contact with so many interesting people, and least that I meet too many people to meaningfully connect with them all. 9. What’s one thing you wish you could do, but probably never will? Again just one thing? Give birth to twins. Ice skate. Write poetry in another language. Wear boots to church. Permanently organize my closet full of children’s clothes. Blue or purple or maybe maroon. Grilled steak with mushrooms and mashed potatoes. Either that or HoHo cake. Nursing my baby while reading a book. Playing Scrabble with my older children or Blokus with my younger ones. Preparing or receiving mail. Shopping for food or gifts (if there’s enough money in the checking account). Curling up in front of the fireplace to read a book. I would say “writing, writing, writing,” but writing is more than a leisure activity for me anymore. Home. If I could have two, all home. 11. Any guilty secrets you’d like to share? Besides how much grilled steak I can put away in one sitting? I’m a very disorganized thinker. And conversationalist. Writing has become an exoskeleton for me, and I can go back and straighten my thoughts later. Also, my mom would tell you that from a very early age, I have liked to shock people. Conveniently for me, in Pennsylvania Mennonite housewife culture, sometimes the quickest way to shock people is by being honest. Now I know you folks are fond of shocking honesty, so prepare yourselves against the morrow. Tomorrow I’ll tell you more about Sheila’s new book! Loved this interview! Got slightly acquainted with her book last week in Israel. Would like to read it. I enjoy her way with words. Put Shari and Sheila together and I’ll be happily entertained forever!! I absolutely love both of you, even though I’ve never met you physically. You both give me permission to be dramatic and messy and honest. (Most folks are alarmed at my shocking honesty and humor, wherewith I begin to hide.) You’re both my faves! Sounds like a lovely read for the month of January. I enjoyed the interview! I would love to meet Sheila. Maybe I could shock her:)! I am with her on shockingly honest…probably my acquaintances wish I would write it instead of say it…loved the interview!!! Lol love it, Shelia sounds like my kind of person but I’m definitely no writer. This is wonderful! This lady sounds like so much fun. Oh I love reading Sheila’s articles in the Keepers at Home magazines. She is one of my favorites. Thank you for sharing with us Shari. For real! She is a hoot! Oh fun. Loved this interview and I learned a few things that I didn’t know even though I’ve showed up at Sheila’s house asking if she would plug in my crockpot for me. I enjoyed this, but I thought we would actually get to see her face! I didn’t do a good enough job of painting it?! She was born a Lehman. Well I can say that we are on the same page about shocking other people with just being honest. I do it on a regular basis! So fun! Added her book to my wishlist. This was quite entertaining:) if she is same Sheila who writes in keepers at home I have fall 2017 issue open on my lap to her article called “Mother of many ” where she said she had 6 children and discussing number 7 and you say she has 7. She must have written that article a while ago or else something magical happened:) lol …would love to read her book. Looks like an interesting book! I enjoy reading her writings in the ladies journal! I just bought the book tonight and read a few chapters. Hilarious.. I laughed several times in every chapter. I love her way with words!